It is that time again! I will be doing monthly giveaways from now on. 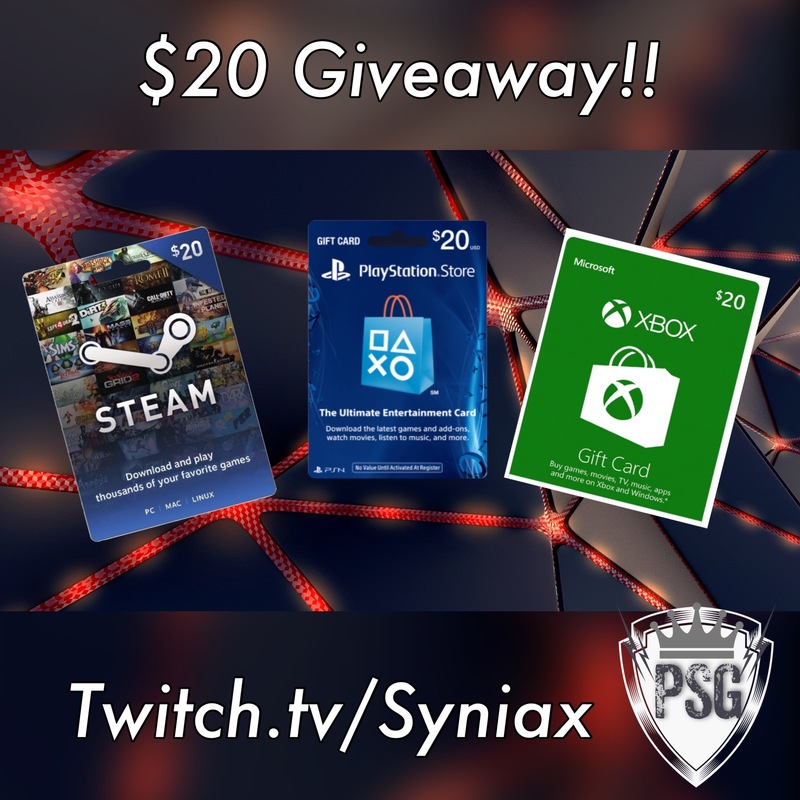 These giveaways will be held on twitch.tv/Syniax and will be for the followers. This Saturday will be the first of many to come. I have very strict rules and details on who qualifies for these giveaways and how it will operate. So pay attention! You must be a twitch follower! If you followed and unfollow after losing you won’t be eligible for future giveaways. Must be active in the chat and put in some stream time during the month! This weekends will be a random giveaway though being that I just started back up. Please do not ask for the giveaway. Details will be available via command which will be found in the title of the stream. Saying comments like “when is the giveaway?” During a giveaway stream does not count as participation for the chat. Continue to question the giveaway will result in a temporary ban. People who donate will get an extra entry in the stream. Minimal donation is 1 dollar. The first entry is free! The prizes are specific to those in the picture. I will not send money via PayPal. You have a choice of the 3 and a code will be rewarded to you at some point after winning. So the way this works if you happen to win is that you have to follow what is stated above to continue on your path of being epic. Also I will contact you after the show or stream with the code! Anyways I thank you all for your support and hope to see all of you this Saturday for the giveaway! Enjoy and always remain epic! Another comeback? Giveaway this weekend?